Severius Atius, an Imperial commoner, lives in the Talos Plaza District of the Imperial City. Severius is the clan elder of his family, which consists of himself, sister Astinia, and her brother Helvo. When not at home, Severius likes to frequent The Foaming Flask and down a few brews. He also visits Helvo at his home in the Talos Plaza District, who doesn't leave home much at the request of Severius. This is due to his dispute with Cyronin Sintav, of clan Sintav in the Imperial City's Elven Gardens District, that has caused bad blood between the Sintav and Atius clans. 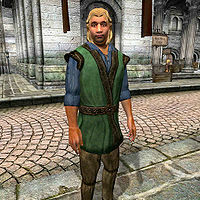 Severius wears a middle-class outfit consisting of a blue and green outfit and a pair of thick cowhide shoes. He wields an iron dagger, and carries the keys to Helvo's and his house, a spare pair of light brown linens, and a medium amount of gold. He apparently wants the feud to end, even though he makes it clear that the Sintav clan will have to make an effort as well: "Sevarius [sic] Atius. We will comply with the Watch's orders. The Atius family will stay clear of the Sintavs... if they stay clear of us." When asked about the Imperial City, he will elaborate: "I agree with the Watch Captain. This Atius-Sintav feud has gone on long enough. I can control my people. I hope Iniel can control his." Esta página foi modificada pela última vez à(s) 17h24min de 22 de julho de 2013.